For Niantics Earth Day Celebration on April 22nd they have decided to bring our (now shiny) Dirt-zilla! Well… possibly! We will have to earn it this time around with global challenges. Assuming we make it past that hurtle, that is only the first step to getting Groudon. Groudon’s got quite the Swiss army knife of movesets that hit its best counters super effectively, so he takes some extra effort to prepare against contingencies. Buckle up and grab your notebooks, because he is going to school all of us on some of the less obvious Pokemon type advantages! That, or just tear down the school itself. At least it calms down in the catch screen! In terms of utility, he is the undisputed best ground type, there are plenty of reasons to hunt this fellow out, being quite likely the best ground type up until the current generation of Pokemon. So ground typing, sounds simple right? Weak to Water / Grass / Ice. Not too bad. Here’s the thing – Groudon has movesets that hit all of those types super effectively. And by “hit” I mean almost certainly 1 hit KO unless you’re packing some weird resistances from typing. So to simplify things some, let’s cover when to use which types. Earthquake – Only one of his movesets where the counters are simple. Water, Grass, Ice are all fine here. Despite STAB bonus making him hit very hard, this is actually by far his easiest moveset. Earthquake is one of the easiest moves to dodge in raids as well, but the dodge glitch makes dodging only a good idea if you are certain you would be able to survive regardless. Fire Blast – Here’s where things start getting complicated. Remember Ice and Grass, two of the three types that are super effective? Yea, the best of those die 60+ times against him. There are a couple of interesting exceptions (discussed below) but in general: If you are facing Fire Blast, use Water Types. Kyogre (very appropriately) rises as its greatest adversary here. Solar Beam – Now don’t get too cocky. Kyogre gets drop-kicked from the #1 choice to not even making the list! Solar Beam eviscerates all water types not named Gyarados. But luckily recent months have brought us many top tier Grass Pokemon who are ready to rise to the challenge. 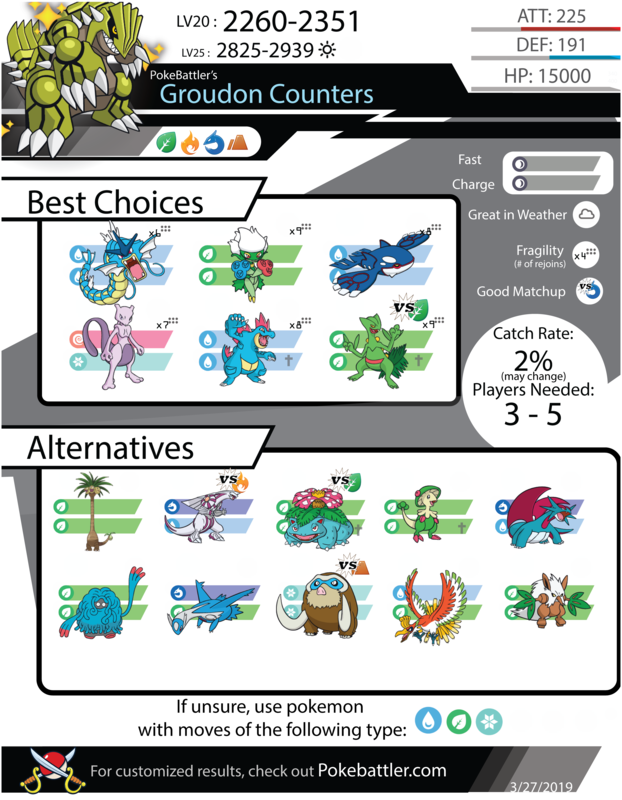 Groudon can be beaten by 3 players in optimal weather, with max friendship and perfect level 40 counters or by 5 unfriended players using level 20 counters from this guide. 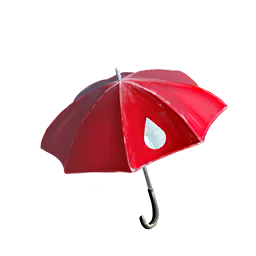 When caught, Groudon will be between 2260 and 2351 cp without a weather boost. In Sunny/Clear weather, Groudon will be between 2825 and 2939 when caught. Delightfully, Gyarados manages to holistically shape up as a superior water type here. His often forgotten Flying sub-type gives him very interesting survivability. Flying has double resistance to Ground which gives him a little bit of an edge there (although not actually enough to pull ahead of Kyogre). 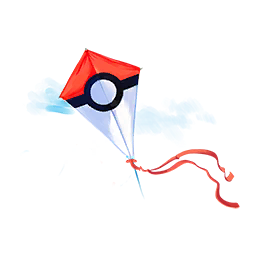 But even more importantly, flying sub-typing allows Gyarados to be Neutral to Grass instead of being weak! This leads to an interesting situation where they are not #1 against any particular moveset, but on the whole, their consistency beats everyone else. If you don’t know the moveset, Gyrados is your safest bet to survive Groudon’s many 1 hit KO moves. While 400 Candy to evolve is as steep as it gets, Magikarp has been common since the games inception, and has had many events boosting spawns. But If this is your first rodeo, there are many other options. 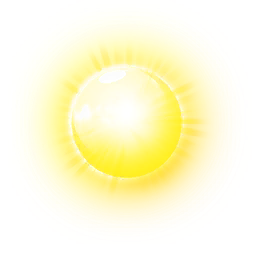 The best option against Solar Beam! Poison Dual Typing helps out a lot here, giving double resistance . Despite appearances, its survivability is only a bit below Venusaur with a significantly better Time To Win. However, it isn’t quite as uncontested against Ground Movesets, facing stiff competition with Water and Ice Types. Here its poison typing hurts more than it helps. And for the love of Arceus, do not use Rosarade against Fire Blast. •⭐⭐☆☆☆ AccessibilityThe traditional nemesis of Groudon is in a tough spot. On one hand, it is bar none the best Against Fire Blast, but it is knocked clear out of the rankings against Solar Beam. Kyogre’s effectiveness depends entirely on Groudon’s moveset. Gyarados also has certain advantages over it as a water attacker (discussed above) that make Kyogre not the clear cut king they typically are. If you’re bummed about Giratina showing up to outclass Mewtwo as a Ghost-type, here’s a neat role for the Grumpy Purple Kitty. Much like Gyarados, Mewtwo’s typing allows it to be very consistent since it never takes super effective damage from Groudon. It hovers around the top 6 against Groudon’s 2 hardest movesets and only falters against Ground Moves because everyone else can finally catch a break. A good option if you are trying to make a general team against multiple movesets. That said, Mewtwo isn’t exactly easy to come by, but at least you can chuck some Charge TMs at it if you want this moveset. Hope you held onto some of these from Community Day! Their performance lies somewhere between Gyarados but there performance is very unreliable depending on circumstances. Against pure Fireblast he manages to come ahead of Gyarados slightly, and against Solar Beam manages to cling at the end of the list (unlike Kyogre). We have alternatives to what he brings, but if you were playing the right day, he is a very convenient choice to bring out here. Manages to fall behind Rosarade in bulk somehow, even with a legacy move-but there is a *very* good chance you have one of these if you were playing recently. As the 3rd best counter against the dreaded solar beam, time to break them out. Last time Groudon came around Exeggutor was all the rage, finally had a pokemon who could survive all of Groudon’s Charge Moves. Dragon Typing negates Fire Weakness, and gives double resistance to Solar Beam. Still, another strong candidate if you are trying to make a reliable team as opposed to a situationally optimal team. Has the distinction of double resisting Fire Blast, and only taking neutral damage from other movesets. Falls behind the aforementioned water types in pure damage, but against fire blast has superior survivability. Basically an alternate to Rosarade, the first time a lot of people became aware of Poison duel typing being handy against Grass. Recently got a legacy move that made him a top tier grass type. Sadly his lower bulk doesn’t make Groudon a good place to show off, but he still tops the charts. Being a flying dragon is fantastic typing against Groudon, double resists both Grass and Ground, and has a typical resistance to Fire on top of that. While he doesn’t top the damage charts, he has the best bulk of any of Groudon’s counters. The only problem is it is pretty rough to get a high-level one. At least he has a community day coming up where we can finally bump up that accessibility. Very very inconsistent, but delightful against Ground movesets. Sadly, Tangrowth was somehow cheated out of getting Grass Knot. It’s still great but outclasses by many many other Pokemon. Good bulk against Fire and Grass attacks, but honestly it’s doubtful you would need to resort to him. My my how the mighty have fallen. Ho-Oh was the main answer we had to Groudon the first time he came out – predating the plethora of interesting duel typing counters we get in later gens. The hidden Power lottery gives Ho-Oh a new trick and it still has phenomenal bulk against Solar Beam. Interestingly enough, Articuno vaults over almost every other mon in snowy weather, going from forgotten to one of your best options. Rather standard Grass Type in this context, but at least it’s accessible. The very definition of inaccessible if you are outside a handful of American states. Poison Duel-Typing comes back, comes into the top 10 against Solar Beam. Far far lower on this list than his Giraffe necked cousin, Dragon typing gives a lot of help against Groudon. Groudon is a fearsome Pokemon to prepare against, but if any Pokemon was going to teach a healthy respect for the Earth – it’s them. Let’s work hard these coming weeks to reach the milestones trainers! Groudon isn’t going to be outclassed any time soon (at least until Niantic pulls more exclusive move shenanigans), and with it being super effective against 5 different types, they are a Pokemon you won’t want to miss out on! Charizard VS Kingdom Cup Meta! Best Fire Type?